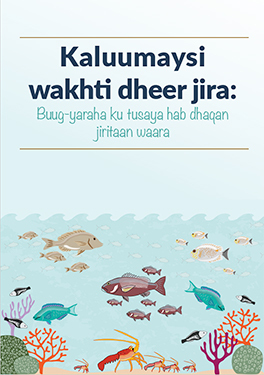 This illustrated guide to sustainable fishing practices is a resource for Somalis seeking guidance on ways to ensure their ocean resources remain healthy and abundant. The story presents two scenarios for the future of Somali fisheries. If the wrong gear is used and small fish and lobsters are continuously taken from the ocean before they can reproduce, fish populations decline and conflict rises over an ever-dwindling resource. However, by using nets with larger mesh and sorting catch to throw back young animals, fish and lobster populations can remain plentiful, leading to successful fishing businesses and long-term livelihood security. Presented as a story from under the sea, this guide is an entertaining and easily digestible way to understand sustainable fishing practices in small-scale fisheries.